When installing hardware, it is important to have precise control of the location of the pilot holes for the screws. The options are to start with a mark made by a scribing point or awl, then use that to locate the drill bit, or drill the hole directly without a preceding mark. Here is my approach. 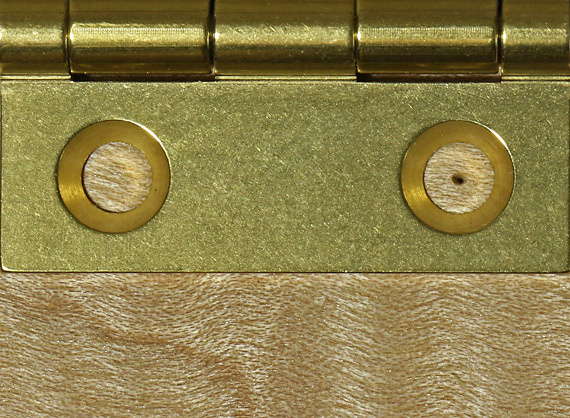 I mark first, and most of the time, I try to center the mark in the countersunk hole of the hardware. 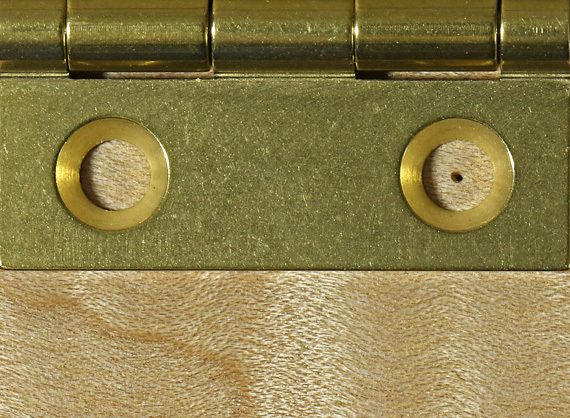 Sometimes, however, I will intentionally very slightly decenter the mark to laterally “pull” the hardware tightly into the mortise, or to one side of a mortise that was made a bit too large. In any case, I do not want a mark that will result in the screw pulling the hardware in the wrong direction. The key is that you want that control. It’s that one-sided tolerance thing again. I love that concept. Here is my low-tech, reliable method. 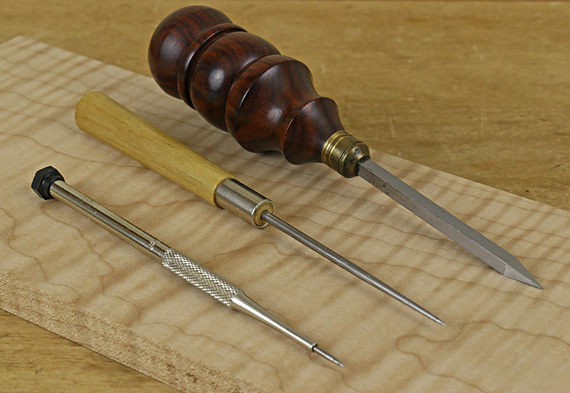 I use a scriber point or pyramidal awl to prick a starting mark for the drill bit. It is surprisingly easy and accurate to judge just by eye if the mark is centered in the hole in the hardware. Good lighting is essential, as in the first photo below. A crescentic shadow on the side of the hole will cause you to misjudge the center of it. The mark in the photo below is actually centered but the shadow interferes with judging it. Sometimes I use a fine point scribe (the two tools to the left in the photo below) to make a tiny mark to seat the point of a brad point bit. Other times I use my wonderful Czeck Edge awl (at right in photo) to start and enlarge a hole suitable to seat a twist bit. 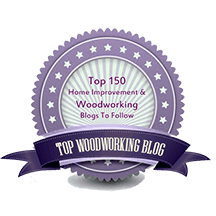 Twist bits are commonly available in more sizes than brad point bits, which is particularly helpful for using tapped holes and machine screws to mount hardware in wood. This simple approach makes it easy to reliably make a deliberately off-centered mark. Just as important, it is also easy to move a mark made with a scriber or awl. Just stab the sharp point into the sidewall of the original mark and push or swish the tool to make a slightly bigger mark with a new center location. How about self-centering bits (one brand is Vix bits)? In all the brands I have tried, there is always a bit of wobble of the drill bit within its housing. Even though I would drill squarely to the work surface, there is some random error in the location of the hole. The errantly drilled hole is then nearly impossible to “move.” Furthermore, there is no reliably controlled way to produce a deliberately off centered pilot hole. Depth control is also difficult or the depth is inadequate. Such bits have been banished from my shop for some time. How about center punches – those that you tap and those that are spring-loaded in various ways? They avoid some of the disadvantages of self-centering drill bits, but all of the ones I have tried, even Starrett’s, also have some wobble of the scriber within its housing. They are faster than the low-tech approach I use but less consistent and, again, there is no good way to make deliberately off-center marks. Such tools also have been banished from my shop. In summary, to accurately locate pilot holes for hardware screws, go low tech, use your skills, keep in mind the one-sided tolerance concept, and use the skillful adjustability of craftsmanship. I use a vix bit. The stock drill bit in it is removed and replaced by a transfer punch that fits tightly, with no slop. The punch leaves an excellent and precise starter hole. This is followed by a larger punch that matches a tapered drill bit. Not really sure what your problem was with the Vix bits. Have been using them for decades with zero issues or hinge installation concerns. Thanks, Tico! Readers, please go to the link provided by Tico. It’s a great idea! For my part, I’ll probably stay with my low-tech method – it works for me, and I especially like the flexibility that it affords. 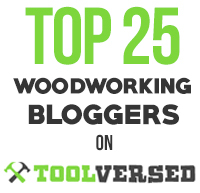 My method is probably slower but I don’t have the same production needs as Tico (Vogt Toolworks). Richard, the Vix-type bits that I have used all have play in the drill bit and randomly produce off-center holes that are then very difficult to relocate, as I mentioned. They may be OK for less fastidious work but I found them unreliable and frustrating for the work I do. Great info, as always, Rob. My trouble is that my bit will often wander even with a starter hole like you show. I normally use my cordless drill and twist bits. Is it probably due to poor drilling technique? A while back, I bought a Starret punch which is designed to center the punch in the middle of the hinge hole. Cost about $34, one-time purchase, no more futzing around. If I need the hole deeper, either the Czech edge or a gimlet (drink or tool). Jeff, I suggest try using a pyramidal awl, like the Czeck Edge above, to adjust the size of the initial hole so that it seats the twist bit well. This is easy to do for small holes, such as 3/32″, 7/64″, but is more difficult for larger holes, such as 3/16″. 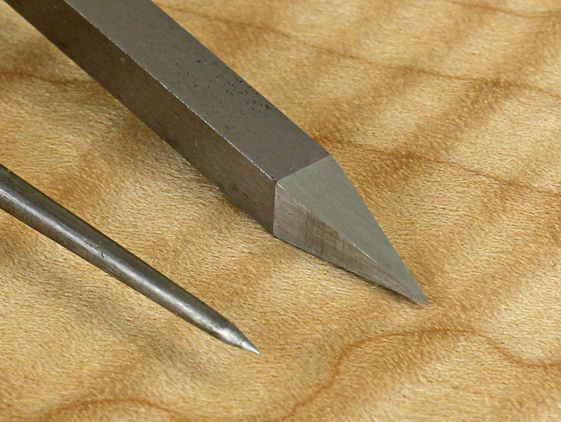 For the larger holes, use a pinpoint starter mark and a brad point bit. OK but I just did not find even the Starrett to produce a reliably centered mark. I don’t know if the drink or the tool should be used first . . .
Like you, Rob, I (used to) usually mark screw hole positions by eye. That mostly works, but the issue of the wood grain sometimes pushing the drill bit off position while drilling is a common enough problem, that for me, it is worth making a drill guide block for the few common hinge sizes that I use on most projects. I cut a rectangle of 3/8″ thick stock to exactly match the outside dimensions of a leaf of the hinge. I usually use brass, but sometimes steel, and for a one-off or short run of a different size hinge, something very hard like Bolivian rosewood. With as much care and precision as I can, using a drill press, I drill the two or three holes to match the hinges with needed pilot hole size for the screws that will go into the wood. 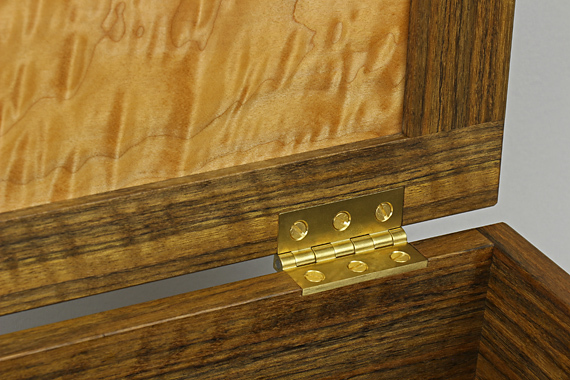 The drill guide block will precisely fit in each hinge mortise, and guide the bit for both verticality and position. This lets me use a hand-held drill for drilling the wooden parts, which is often better than trying to get the box or case onto the drill press. I find that this kind of drill guide block quickly repays the time needed to make it, with greater precision, reduced layout time, and almost complete elimination of marking errors and grain-induced bit drift. Thanks for the comment, Derek. I guess I’m not willing to go through that much trouble but it does show that locating these screws is not so easy.